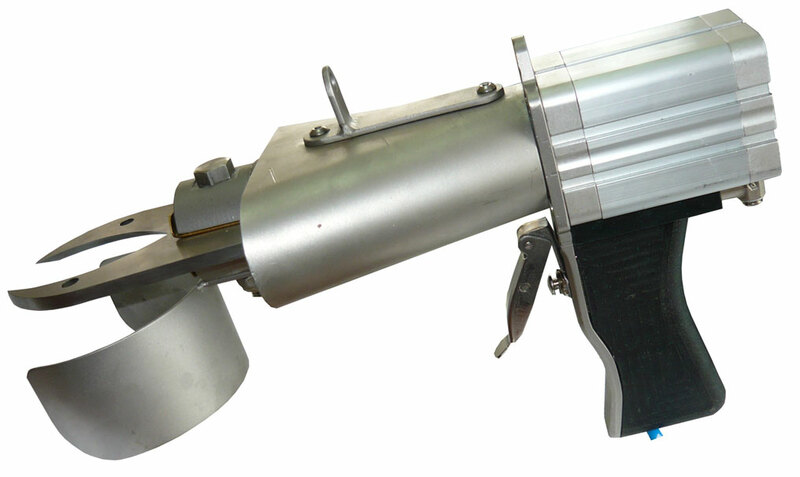 The automatic foot cutter is designed for cutting chicken feet in a poultry slaughtering line. The foot cutter is made of stainless, acid-resistant materials. The blade is made of special tool steel. The cutter is suspended from the supporting structure of the overhead chain conveyor. Carcasses, transported in shackles of the conveyor, are placed on the wheel, which transfers them to the blade during rotation. The blade and transferring wheel adjustment system is designed so that it allows for adjusting the cut height to match bird size without the need to stop the slaughtering process. Another benefit of the system is the possibility of adjusting the blade so that the cut is always performed precisely at the knee joint. 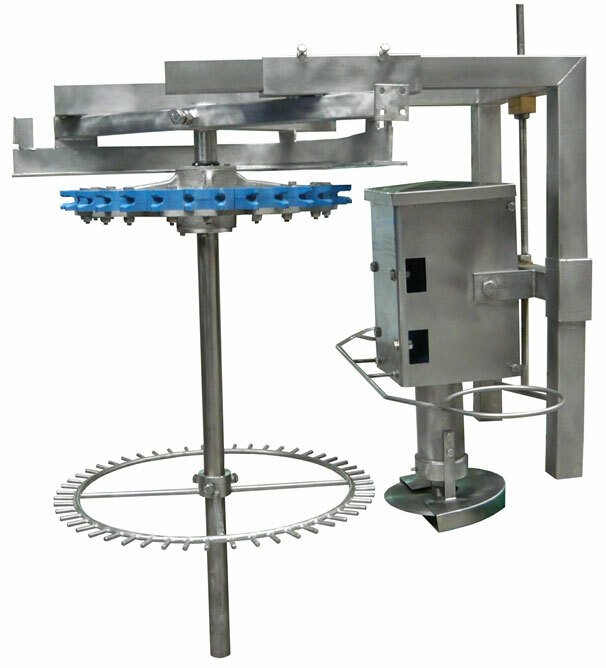 The suspended foot cutter is designed for cutting chicken and hen feet in a poultry slaughtering line. The suspended foot cutter is made of stainless, acid-resistant materials. The cutting blade is made of special tool steel. The basic elements of the cutter are: a fixed frame, a sliding beam, a motor with spindle (drive unit), a blade. The fixed frame of the cutter is mounted to the supporting structure of the overhead conveyor – over a 180° or 90° curve. The carrier disk of the cutter is mounted coaxially with the turning wheel of the curve. In special cases, the cutter can also be mounted at a straight section of the conveyor. Carcasses transported in shackles of the conveyor are positioned and stabilised by the carrier disk before cutting. 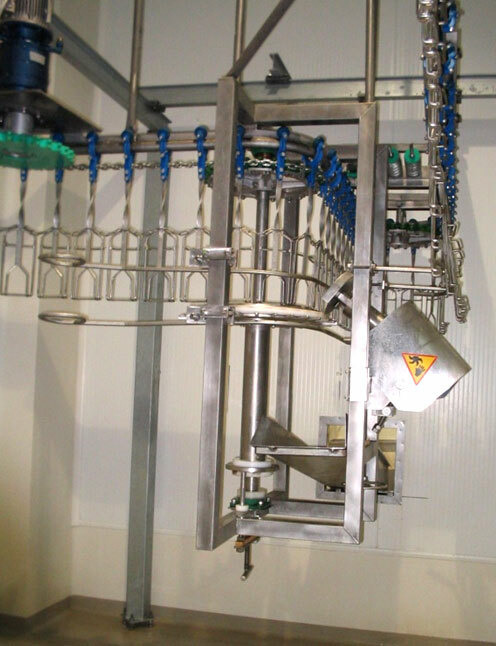 The sliding beam, with the drive unit, fixed to the frame, can be used for adjusting the blade angle and foot cut height – depending on the size of processed birds. A simple and reliable adjustment method allows for precise cut across the line of the joint. The manual cutter is designed for cutting feet, necks or wings. The basic element of the cutter is its pneumatic mechanism, fitted with scissors made of specially hardened stainless steel. The shape and size of the scissors is adjusted to the size of processed birds, and thus to the size of cut elements (turkey, chicken, duck or goose parts). Compressed air is supplied to the cutter through a hose, from a filtering and reduction unit, to ensure proper and reliable operation of the cutter. The major advantages of the cutter include: wide usage possibilities, easy operation and maintenance. The manual cutter (pruner) is designed for cutting feet, necks or wings. The basic element of the cutter is a pneumatic cylinder equipped with scissors made of specially hardened stainless steel. The shape and size of the scissors are designed so that the cutter can be used for cutting elements of different sizes for processing during slaughtering (elements of turkey, chicken, duck, goose). Compressed air, supplied to the cutter through a pneumatic conduit, is pre-conditioned in the filtering and reduction unit, which ensures proper and reliable operation of the cutter. The main advantages of the cutter include: a wide range of applications, easy and intuitional operation and maintenance.